When Shibu, an IT professional, got a 3-year posting in Silicon Valley, it was a dream come true for him and his wife. But it was dismal news for his aged parents who were in their seventies. All the four of them till now were living in a sprawling rented bungalow in Trivandrum. The two-storey house had four doors opening out into the porch & a terrace-garden, as well as a large main gate. It was situated in a posh colony, where houses were far apart. The ageing couple knew that they couldn’t continue living there. Finally, a solution was found: Shibu bought his parents a low-rise apartment, which had the security features of a gated community, and the company of like-minded people living in the same space. Further, they could live without worrying about opening/closing main gates & house doors, hunting for help to get the house & the surroundings cleaned at regular intervals, and face the risks of personal security. Asha had a fear of heights from childhood. Even though she was now in college, she couldn’t grow out of the phobia. And that’s why her parents, both of whom were employed, decided to buy a first floor flat in a 5-storey apartment complex. Asha was comfortable in her new home, spending time in the balcony or running up and down the stairs–rarely taking the elevator. When Santosh got a high-paying campus placement job in Trivandrum, he decided to bring his physically active parents living in a remote village to the city. They were reluctant to come, because they had never before stayed outside the familiar environs of their ancestral house. Moreover they were highly skeptical of using lifts, and wished for a carefree unencumbered life, closer to the ground enjoying the delights of flora & fauna. 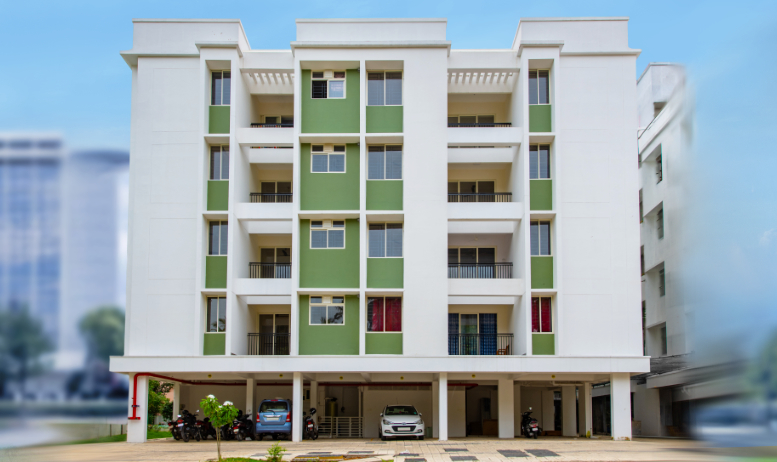 Santosh showed them his 2nd storey apartment in a low-rise complex, which he had rented. His parents realized that all the rooms were well-ventilated with plenty of natural light and breeze. And the staircases were convenient to climb up & down with supporting banisters, and there was the option to use the lifts too. Moreover they could enjoy outdoor walks, be among flowering plants & trees– even birds used to visit their balcony. After staying for a few weeks, they had got over the nostalgia of their ancestral home. A lot has been written about residential high-rises, skyscrapers and towers, with these magnificent buildings dominating the urban landscape; and enticing pictures of such complexes vying for space in the online and offline media. However, there is also emerging a steady demand for residential blocks, which while having the basic advantages of these skyscrapers, have the flexibility of more intimate spaces, devoid of a multitude of flats & facilities. And that is where low-rise apartments step in to fill the bill. A low-rise apartment complex has about 5 floors, maybe six sometimes. Some of the conveniences of low-rise buildings have been illustrated in the life-like examples earlier in this blog. However, this doesn’t imply that low-rise apartments are made for a certain category of residents. While they do enjoy a preferential advantage, most of such low-rises are occupied by just about everyone who wants to live in a secure gated community, where most of the common amenities, utilities and facilities are taken care of by the Apartment Association/Society. And of course, each family is looking for an optimum blend of economical, locational, logistical and operational advantages—which can make their lives enjoyable. Low- rise also means low risk during emergencies like fire or earthquakes; occupants can use the stairs, because normally the elevators are de-activated in such emergencies. Thus a low-rise building will be comparatively safer during a natural calamity. And especially when there are residents who have impaired movements or families with infants and toddlers to carry, low-rises appear to have a competitive advantage in such emergencies. Next PostNext Have Land? Explore Opportunities as a JV Partner!